The promise of the cloud is to make businesses more effective, more mobile and more secure. Today, more than 2 million paying businesses have chosen Google Apps for Work to advance communication, collaboration and productivity across work teams. In addition to all the goodness that Google Apps offers, many businesses look to the cloud for things like customer relationship management and telephony tools. Through our relationships with Google for Work Technology Partners, today we'll start recommending applications that help our customers get the most out of the cloud. When we launched Google Apps in 2006, there weren’t many cloud apps on the market. Today, almost 10 years later, cloud software options abound. In some cases, this can make deciding on the right solution harder for customers. It can be difficult to assess which apps are secure, reliable, high-performing and well-integrated with the tools customers use most. And many businesses have neither the time nor the capability to do this assessment across all of the apps they might consider. To make this journey easier for our customers, Google will begin recommending apps from other providers. These apps are reviewed by Google and an independent third-party security firm to make sure that these solutions are safe and reliable, and meet our requirements for high quality integrations. An example is Smartsheet Project Management, which seamlessly integrates with Google Calendar, Gmail, Drive and Single Sign-On to deliver a great user experience, while meeting the security and integration requirements of a robust web solution. This list will continue to grow as we review and add more apps. 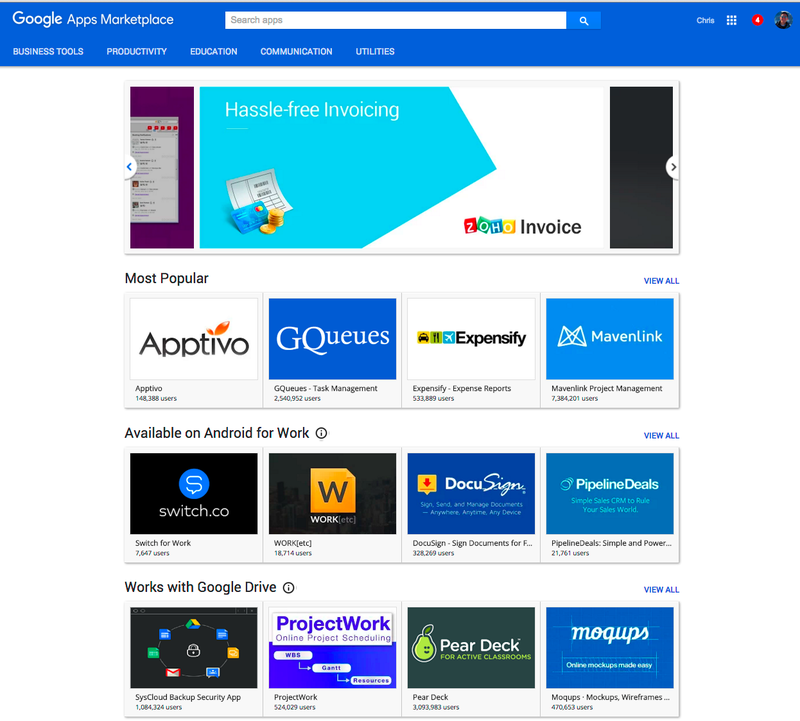 The Google Apps Marketplace carries hundred of apps, including those that we’ve reviewed and recommended. These apps have been installed hundreds of millions of times by Google Apps customers. We recently updated the Google Apps Marketplace to make it easier for employees to find the right apps and added new notifications to let employees know when they have access to apps that just became available. To make it even easier to get your favorite apps on all of your devices, we’ll begin to feature a number of apps that also have Android mobile versions, with links to their Google Play for Work counterparts. These updates will help Google Apps for Work customers find the best apps for their needs, while making it simpler for employees to use any app on any device.